Welcome to Mooseys Country Garden. 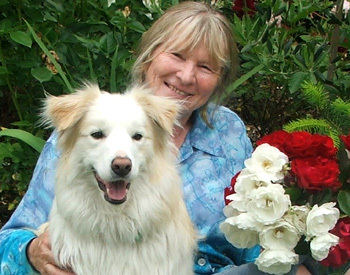 This is the never-ending story of a one-woman country garden in New Zealand and its long-lived, frost-hardy, perennial Head Gardener (me). I'm a compulsive gardener and chronicler, and Mooseys Country Garden has been making its small contribution to the gardening internet for over fifteen years now. The Moosey Garden informally rambles over more than three acres, with roses, foliage plants, paths, and lots of New Zealand native evergreens. The planting style is rather robust and random, with not very many straight lines evident. There are wooded areas, lawns and shrubberies, flower gardens (I love roses) and water features. My large country-style pond has - dare I mention it - rather a lot of garden gnomes in residence. 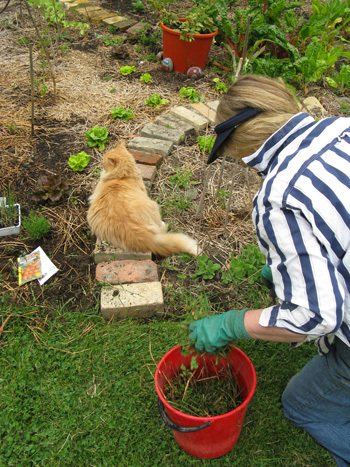 My garden is home to seven happy, sociable cats (all rescued as feral kittens) and a red Border Collie dog called Rusty, plus the noisy local wildlife (mainly bellbirds and fantails, bumble bees, and some pheasants). The property also has a small flock of merino sheep, with a few lambs born each spring. I'm a compulsive rescuer, and I provide a country sanctuary for unwanted plants both big and small - particularly roses. I'll go and dig them out personally, rather than have them abandoned or dumped. Poor things! That is, when I'm not hidden somewhere in the real garden planting my latest plant treasure. As far as writing credentials go I'm strictly home-grown. But I am a web-ancient, writing and publishing my journal many years ago, while the word 'blog' was still germinating. After all these years of word-watering, adding compost and spraying (organic, naturally), I still call my journal a journal. As a gardener, the more I think I know, then the more I find there is to learn. And then I have those heady days when I think I know everything! Oh dear... But I have so much fun trying, every day, to be a good gardener, to work hard, and nurture this precious land I live on. I am so lucky! I love having garden visitors. So you're most welcome to drop by my garden any time. Meet the cats, sit on a garden bench (oops - it's rustic, so might be a bit wobbly), enjoy the foliage and flowers, and join me in pondering 'The Meaning of Gardening Life'. Moosey's Country Garden is situated 20 km from Christchurch, New Zealand, on the flat Canterbury plains in the South Island. Our property is almost flat and lies in the flood plain of the Waimakariri River. Moosey's Country Garden takes our visitors' privacy very seriously. We do everything we can to ensure that your personal details are kept away from prying eyes. Don't infringe Big Fat Sifter's Garden Copyright. Legal disclaimers and content ratings are also included here. Eggy is my senior Son and this site is his mothers day present and retirement present for 'years of teenage angst'. He lives in South London. By day he's a web developer and search engine consultant for a leading UK financial firm. A garden website is the perfect companion hobby to gardening itself. Associated activities will fill up cold winter evenings as well as summer days too hot to go outside. Moosey's Country Garden is a home grown labour of love. The Moosey website is about four P's - Plants, Pets, Places, and People. Relatives, friends, and famous gardeners are often mentioned. Occasionally a reader must be perplexed - for example, who exactly is this walking friend? And this David Austin man?